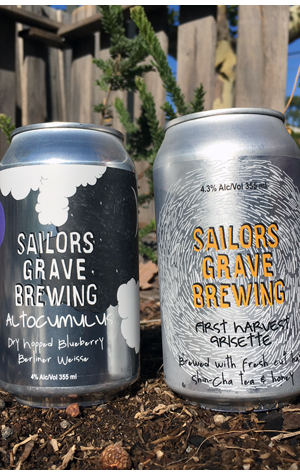 East Gippsland brewery Sailors Grave continues down its idiosyncratic path with its first two seasonal releases of 2017. Both make use of the natural resources local to the brewery and both offer something for fans of off kilter beers. One is the second in the Altocumulus dry-hopped Berliner Weisse range. Its predecessor, featuring mandarins, made our Best New VIC Beers of 2016 list; here, the mandarins are replaced with blueberries, with Amarillo and Cascade the chosen hops. Clearly, they didn't hold back when out picking the fruit, as the beer pours a cloudy mauve colour and throws off a potent combo of candy like blueberries and citrus. There's more of a bitey tang than with the mandarin version – more bitterness too – which should satisfy those who found the first Altocumulus too gentle for their liking. As for the First Harvest Grisette, abandon any thoughts of hop harvests (we're too early for that, after all). Here they've created a farmhouse ale featuring hay harvested from the Snowy River Plains, local spotted gum honey and Shin-Cha green tea from Ttotaler Tea. The distinctive farmhouse yeast is to the fore, adding spiciness and a little banana to the mix in a beer that blends sweetness with floral, lemony, herbaceous characters, hints of farmhouse funk and a pleasant, tannic, dry finish. You can imagine chefs and sommeliers having a lot of fun with this one.